Putting together a playable folder is simple and recommended. It means anyone can download your game and simply unzip it, click and play. This is how you do it. First make a new folder on your desktop and call it whatever you like. Inside create two new folders named data and audio. These two folders must be named exactly the same as the data and audio folders in your TRLE folder. It has been known for audio folders renamed as Audio to cause problems as the game engine couldn't find the audio tracks to play in game. 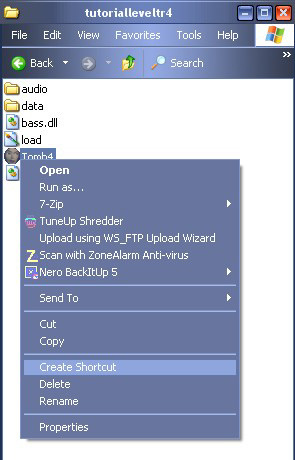 Place all your game audio music files into the audio folder in your new folder. 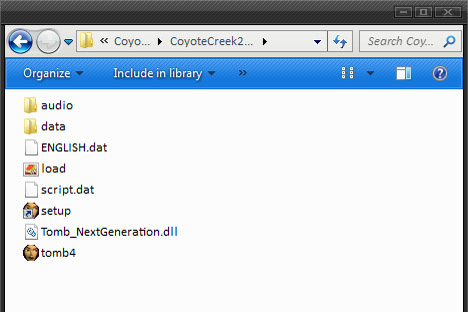 Put your TR4 level files into the data folder along with your logopak file and title.TR4 file. Without the logopak and title TR4 your game will not work. 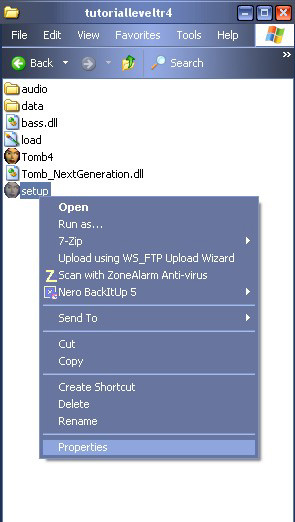 In the main root folder you need the two DAT files, English and Script, the load.bmp, the tomb4 exe and the tomb_NextGeneration.dll, all of which can be copied from your TRLE folder. You can also put your Readme text or doc file in here as well. Note: use the tomb_NextGeneration.dll you used to build and test your level. Do not use any other version even if there is an update available. If your game is working and it has been tested and it is all working, there is no point whatsoever in changing or updating this file. If you do change this file you must retest your entire game again to ensure there are no new bugs. When first playing a new game, the Editor will create files, such as bass.dll, LastExtraction.lst and Slot_Flags_0x32. These files should not be included in your release package as they are created by your machine for playing on your machine and may not be compatible with other machines and other operating systems. Now we need to create a Setup exe for your players. Right mouse click on the Tomb4 exe and select Create Shortcut. 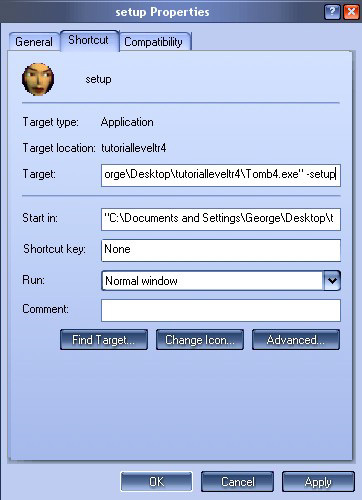 This places a shortcut to the Tomb4 exe in the same folder. 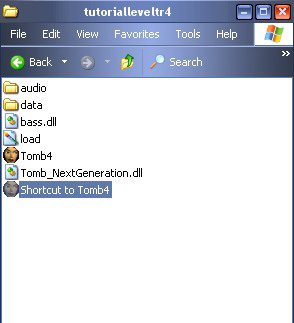 Now rename this Shortcut to Tomb4 file to Setup. Then right mouse click on it and select Properties. Go to the Shortcut Tab if you're not already there and you should see Target highlighted. -setup as in the illustration below. You must have a space and then the minus sign and then setup or it won't work. Once that's done, click Apply and OK.
Now you can test your game by clicking the setup exe to set your screen resolution and other in game requirements, then the Tomb4 exe to start your game and ensure it all works. Afterwards, you will notice that the LastExtraction.lst, bass.dll, and possibly other files will have appeared. These files are not necessary in the download and should be deleted as they will be automatically created by players' machines when the game is first started. The important files are your audio folder, your data folder (including the title.tr4 and uklogo.pak), your english and script dat files, the load bmp image, setup, tomb4.exe, and the Tomb_NextGeneration.dll you used to build your adventure. Before releasing, download your own final game package and test it.